At Medical Center Eye Clinic, we want patients to understand that when you suffer from type 1 or type 2 diabetes, you’re more likely to develop eye problems when compared to patients without the disease. At our eye clinic in Salem, Oregon, we help patients combat the damage high blood sugar can cause to the tiny blood vessels in your eyes over time. This effect can lead to an eye disease called diabetic retinopathy. High blood sugar can also lead to the development of glaucoma and cataracts as well. This makes it especially important for patients to keep their blood sugar levels in check and to schedule regular exams in order to take care of your eyes. Nearly 33 percent of patients with diabetes will eventually develop retinopathy – damage to the blood vessels in the retina, the lining of the back of your eye. Non-proliferative retinopathy – which doesn’t typically threaten your eyesight – is the most common. If you continue to struggle with high blood sugar levels for several years, however, you could be at a higher risk of developing diabetic retinopathy. It’s called “proliferative” because new blood vessels begin to grow on the surface of the retina itself. These blood vessels are very fragile and can leak blood or fluid. This causes scarring of the retina and long-term vision loss. Diabetic retinopathy can also cause macular edema. This occurs when fluid leaks into the part of the retina that gives you the sharp, central vision required for driving, reading and seeing the finer details of things. This condition can make things look blurry instead. A number of studies have found that you can successfully lower your odds of losing any vision as a result of retinopathy and macular edema with a strict control of your cholesterol, blood pressure and blood sugar levels. Fortunately, when found and treated early, some forms of the vision loss due to diabetic retinopathy can be slowed or reversed. If you have diabetes, you should schedule a visit to our eye clinic in Salem, Oregon annually to ensure your eyes stay healthy. Diabetes and cataracts: You’re more likely to develop cataracts at a younger age if you have diabetes. Cataracts cloud the lens of your eyes causing cloudy vision. If you suffer from mild cataracts, wearing glare-control glasses and sunglasses could help. If the problem is severe, cataract surgery replaces the cloudy lens of your eyes with man-made lens to help clear up your vision. Diabetes and glaucoma: Diabetics have more than twice the chance of developing glaucoma – a condition that causes added pressure in the eye – when compared to those without the disease. The extra pressure glaucoma causes can damage the retina and the optic nerve, the main nerve in the eye for sight. Patients who have glaucoma are unlikely to demonstrate symptoms early on in the disease’s development. Some patients will begin to slowly lose their vision or see bright halos or colored rings around lights. Glaucoma can be treated with prescription eye drops to lower eye pressure, but some patients may require surgery or laser treatment. For patients with diabetes, protecting your eyesight means taking extra precautions to safeguard your overall health. Here are a few tips to help lower your risk of persistent long-term eye problems. Manage your blood sugar. Steady blood sugar levels can slow the damage to the tiny blood vessels of your eyes. This helps to prevent or even delay the start of many of the eye problems linked to diabetes. Manage your blood pressure. Controlling your blood pressure can help to slow or prevent eye diseases linked to diabetes. Make sure to have your blood pressure checked each time you visit your doctor. Receive yearly “dilated” eye exams. By widening your pupils with special drops, our Salem eye doctors can examine you for the early signs of damage that diabetes may be causing to the blood vessels in your eyes. Watch for symptoms. 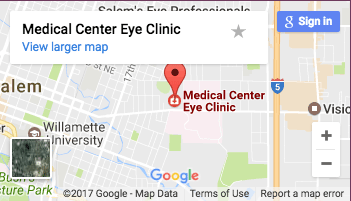 The sooner you notice any problems with your vision, the more quickly you can seek help at our eye clinic in Salem, Oregon. Blurry, cloudy or double vision; floating, dark or blank spots in your vision; constant pressure, pain, or redness in your eyes; troubling seeing out of your peripheral vision; and trouble seeing straight lines are all potential symptoms for long-term eye disease. Stop smoking. Smoking causes damage to your blood vessels and increases your risk of developing eye problems. ← We Are a Dry Eye Center of Excellence!